In the early nineteenth century the foundation was laid for a delightful spa experience with the establishment of salt water baths. It was the best place to take the cure for ailments of the respiratory tract. So, under the mantle of the monarchy, the wing was marked by a main entrance. Visits by such esteemed guests as the Empress Sisi and the nobility were the order of the day. As a consequence, several health spas were built in the mid-nineteenth century. Only after the First World War were they finally merged into the main spa building. This building served as the foundation for today’s Eurotherme, which has a inhalation and hydro wing. 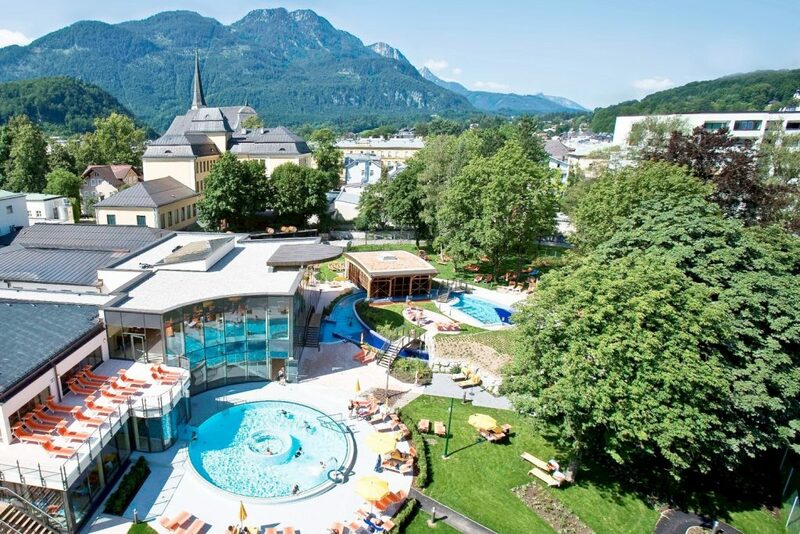 The spa building is located on the Salzkammergut Cycle Trail. The inhalation grotto is primarily used for freeing the airways. The saltwater pools have a 3% salt content and kept at 33 degrees. It penetrates deep into the pores to firm your skin and give it the royal treatment. The salt sauna, which has a grotto and well-tempered humidity connects the indoor and outdoor areas. For a really unique experience, why not try a tropically themed thermal infusion afterwards? You can explore the exclusive areas of the sauna complex until midnight. There is also a day just for women, where there won’t be any men to listen in to conversations.